The Paria River is a tributary of the Colorado River, approximately 95 miles (153 km) long, in southern Utah and northern Arizona in the United States. It drains a rugged and arid region northwest of the Colorado, flowing through roadless slot canyons along part of its course. It is formed in southern Utah, in southwestern Garfield County from several creeks that descend from the edge of the Paunsaugunt Plateau, meeting just north of Tropic. It flows SSE across Kane County and Grand Staircase-Escalante National Monument. 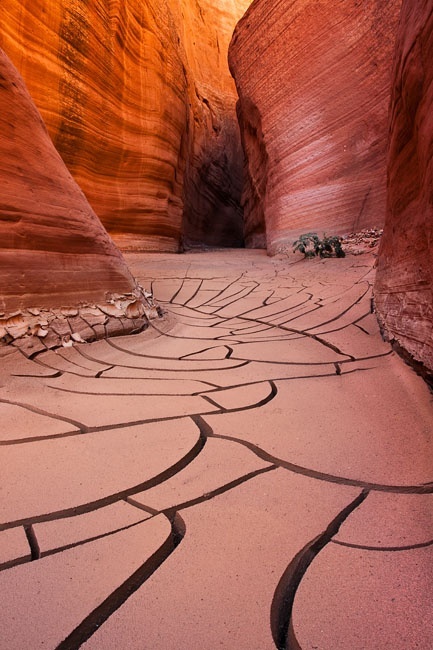 Along the Arizona state line, it descends through the Vermilion Cliffs in the Paria Canyon and onto the Paria Plateau. It joins the Colorado from the northwest approximately 5 mi (8 km) southwest of Page, Arizona and the Glen Canyon Dam. The lower 20 mi (32 km) of the river are within the Paria Canyon-Vermilion Cliffs Wilderness, which is administered by the Bureau of Land Management; a permit is required for any overnight visit. The Paria is essentially a large creek and is not navigable.